Rachel Von | The Journal Gazette Trine’s Lamar Carswell tries to get past Manchester’s Dillon Nelson during the first quarter Thursday. Carswell scored four touchdowns. Rachel Von | The Journal Gazette Manchester's Kevin Georges tries to get through a pack of Trine players during the first quarter at Trine University on Thursday. Rachel Von | The Journal Gazette Trine's Lamar Carswell runs the ball along the edge of the sideline as Manchester's Nick Tillmann tries to stop him during the second quarter at Trine University on Thursday. Rachel Von | The Journal Gazette Trine's Brandon Winters races down the field with the ball scoring a touchdown during the first quarter against Manchester at Trine University on Thursday. ANGOLA – It had been nearly nine months since Lamar Carswell scored the final touchdown of Trine's 2017 campaign, but it took him less than three minutes to put up the Thunder's first points of 2018 against Manchester on Thursday night. 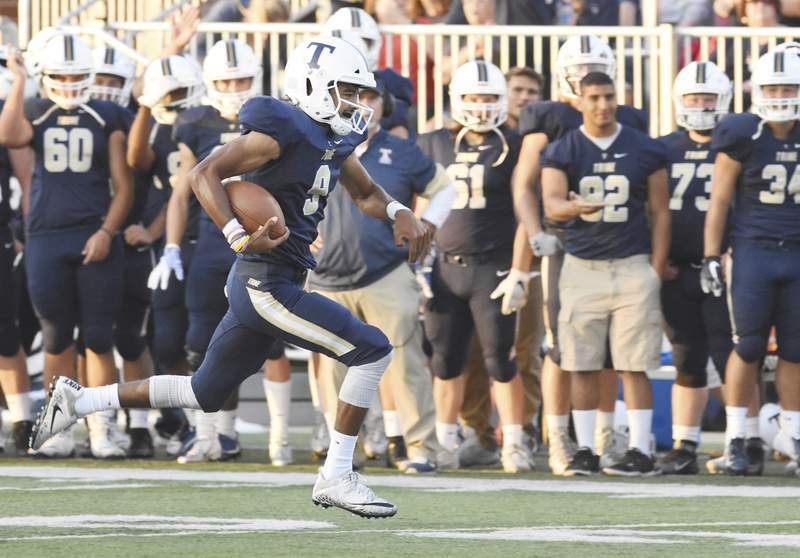 The senior running back pulled down a 14-yard touchdown pass from quarterback Andrew Duckett and sailed into the end zone to kick off a 55-7 Trine win at Fred Zollner Athletic Stadium. Carswell matched the school record for touchdowns (45), then broke the school record for points scored (previously 270) with one catch. Carswell scored again less than five minutes later and then again in the second and third quarters. He finished the game with four touchdowns and 176 yards of offense. It was also a record-tying night for Marcus Winters, who matched the school record with his 19th interception midway through the first quarter. “I actually knew I was going to get the ball, because it happened my junior year, it was the exact same thing that happened this year,” Winters said, telling his coaches and fellow players that he recognized the play from Trine's previous meeting with the Spartans last year. Cayleel Hill was not as prepared for his interception. The Spartans had their first true scoring chance in the red zone late in the second quarter, but Hill picked off the pass and ran 90 yards for a touchdown to put the Thunder up 27-0. It wasn't just Carswell creating headaches for the Spartans. Brandon Winters and Duckett, who were splitting time at quarterback, each rushed for a touchdown, Winters for 58 yards. The Spartans finally scored on a 9-yard pass from Bryce Tomasi to Harrington Greer with just over three minutes left in the first half. 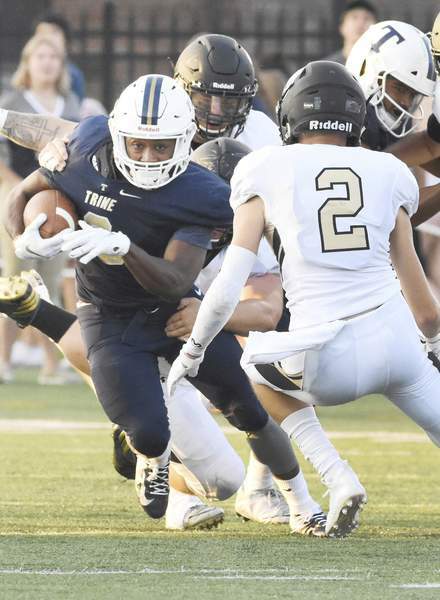 The Trine offense provided most of the fireworks Thursday night (literally, fireworks were set off to mark each touchdown), but the Thunder defense also made some noise. Although not as long as Hill's 90-yard dash, Hunter Hiatt accounted for Trine's second pick-six in the third quarter. 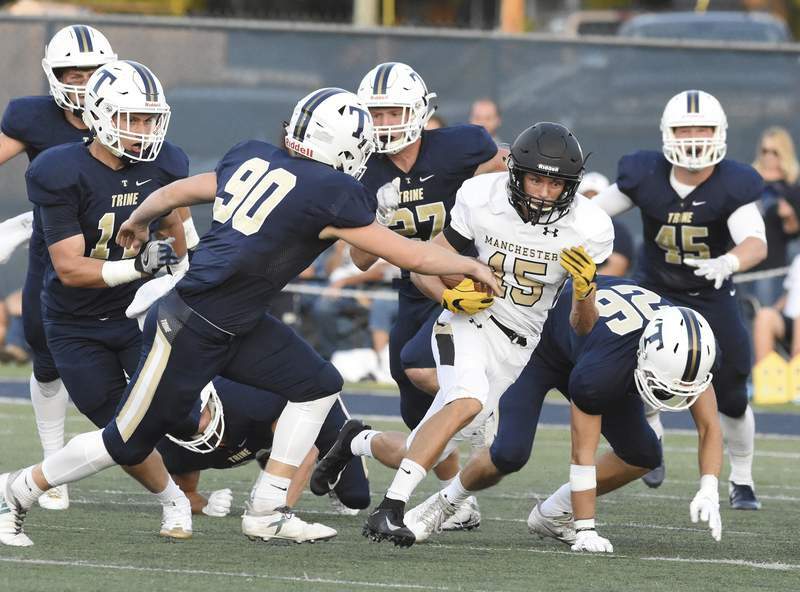 The unit also made an impressive stand in the second quarter, preventing Manchester from scoring even after the Spartans recovered a fumble on Trine's 2-yard line. 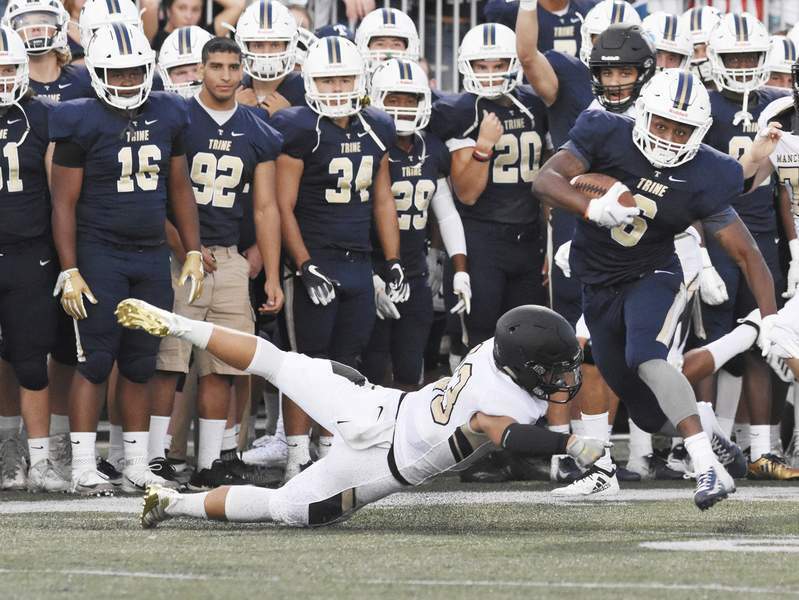 Trine's season continues with a visit from Bluffton at 1 p.m. on Sept. 8, and the Spartans will try to get back on their feet at Alma that night.